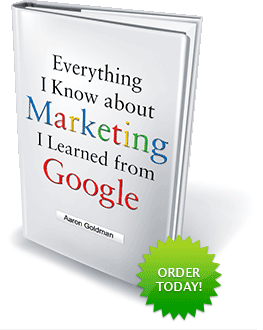 In 10 years, will everything I know about marketing still be learned from Google? Who knows. It’s unlikely search as we know it today will be search as we know it in 10 years. Relevancy must be replaced with usefulness. This means reimagining the search interface. This means changing the search paradigm. The key will be allowing people not just to search but to search and act. In the coming years, we’ll see a shift in focus towards applications that can handle complicated tasks based on our stated intent — eg, planning a trip to Italy. Google’s role could be providing search functionality within apps or it could be a provider of apps and/or app platforms. In a world of Ambient Findability, everything and everyone is locatable and navigable. This enables information to interact with other information without pesky humans getting in the way. Today this is accomplished via application programming interfaces (APIs). Hunch.com is way of applying artificial intelligence to enable decision-making. Siri is an iPhone app that acts as a virtual personal digital assistant. These are just 2 examples of the potential that “app-sisstants” or “search-and-act” engines hold. The monetization model for app-sisstants is unclear but brands will have a role. To give your organization the best chance to succeed in a world of search-and-act engines, follow the 20 Googley Lessons in this book. However marketing is defined in the future, applying each of the Googley Lessons we’ve learned will be critical to success in this brave new world of search-and-act engines. May 5, 2010: I wonder if Steve Jobs somehow got an advanced copy of my book? Perhaps, like his iPhone 4G, one of my associates mistakenly left the manuscript at a bar. On 4/28, the Wall Street Journal reported that Apple had acquired Siri. As I wrote in today’s MediaPost column, I take this to mean that “Apple is Siri-ous about Search.” Perhaps, in 10 years, everything I know about marketing will have been learned from Apple. Aug. 11, 2010: Mint.com is another great example of an app-ssistant that uses APIs to gather data from multiple sources and create added value and time savings for its users. May 29, 2011: There’s a new app-ssistant in town, Do@. Essentially, it’s a search engine for apps. Smart way to organize the mobile search experience. Rather than returning web pages, it shows you apps that have the content/functionality you’re looking for. Changes the search paradigm from crawling publishers to letting them (or app developers) answer themselves. Same concept as the API economy for the fixed (non-mobile) web I described in the book. Profile and intro video courtesy of TechCrunch. August 15, 2011: In an attempt to future-proof its business and protect the Android ecosystem, Google has gone to great and unusual lengths… buying Motorola Mobility for $12.5 billion. MIT’s Technology Review has good analysis of the deal and Google’s motivations for doing it. October 5, 2011: It’s been over a year since Apple bought Siri and 18 months since I interviewed Siri CEO, Dag Kittlaus while researching my book and preparing to highlight Siri in this chapter as an example of what the future of search looks like. We haven’t heard much from Siri since being gobbled up by Apple but the little app that could made a big splash today as part of the iPhone 4S launch and now has a dedicated features page on Apple.com. People rejoice! Google look out! The era of the app-sisstant is upon us! November 21, 2011: Hunch, the original decision engine, was bought by eBay to help personalize the shopping experience. December 28, 2012: Apparently, Google read my crystal ball. 2 weeks ago, it bought an app-ssistant of its own. Today, I shared thoughts on what it all means in my column, Will Clever Sense Help Google Become The Perfect Search Engine? Pingback: Affordable SEO System » Will Clever Sense Help Google Become The Perfect Search Engine?